Mites are one of the smallest species of pest, most mites are tiny and less then 1mm in length. (can vary between 0.25 to 0.75mm) Mites have a simple, unsegmented body plan, although they seem to be almost invisible to the naked eye. The Mite’s impact on the surrounding environment can cause a large amount of damage. The majority of mites are blind and have minute bristles on their body. These act as sensors allowing them to easily navigate around. The life cycle of mites starts out as eggs, followed by Larva, Nymph and finally Adult stage. The eggs can take 2-6 weeks to hatch however the longevity varies between species but is still quite short. Flower buds are one of the favourite places for Aphids to hide. When it comes to identifying what type of pest is swarming in a garden, the first step would be to investigate. 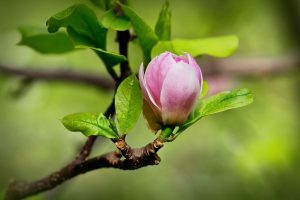 We will need to see if there are any critters on the plant, under the leaves or in the flower buds. Those are the most common places for them to hide. For insects, lets talk about Aphids, Scale, Mealy Bugs and Citrus Gall Wasps. The second step is to identify any type of pest activity. Pest activity for Scale are shell-like bumps on the plant and stunted growth of emerging shoots. Poor plant health and yellowing of leaves are also a sign. 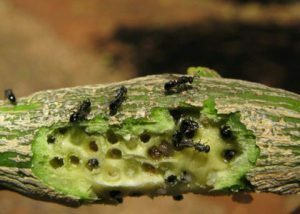 Scale are another sap-sucking pest and can be referred to as a parasite due to the large populations that begin feeding as soon as they find a suitable spot on the plant. They then can develop a hard-outer shell which looks like protective armour. Pest activity for Mealy Bugs indicate a whiteish substance on the plant leaves, new growth is distorted and sooty mould could be present. Mealy Bugs are covered in white hairs and a mealy coating. They feed on plants while excreting a honeydew, known as a sticky substance that attracts ants. The larvae of a Citrus Gall Wasps, eating the plant from inside out..
Pest Activity for Citrus Gall Wasps include callous-like bumps on the stem of a citrus tree and loss of new or existing fruit. This fruit fiend can cause a lot of damage in the larvae stage. The adults lay their eggs in the stem waiting for them to hatch and the plant is then eaten from the inside out. When treating any type of insect infestation, we must conssider the surrounding environment, existing soil life and the present and future growth conditions of plants. Using an insecticide containing poison may kill off the insects, however the plant and beneficial Soil Microbes may become negatively impacted. 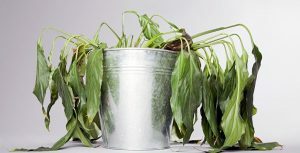 This can result in an garden area that can’t support a healthy garden and the existing plants may slowly die off. 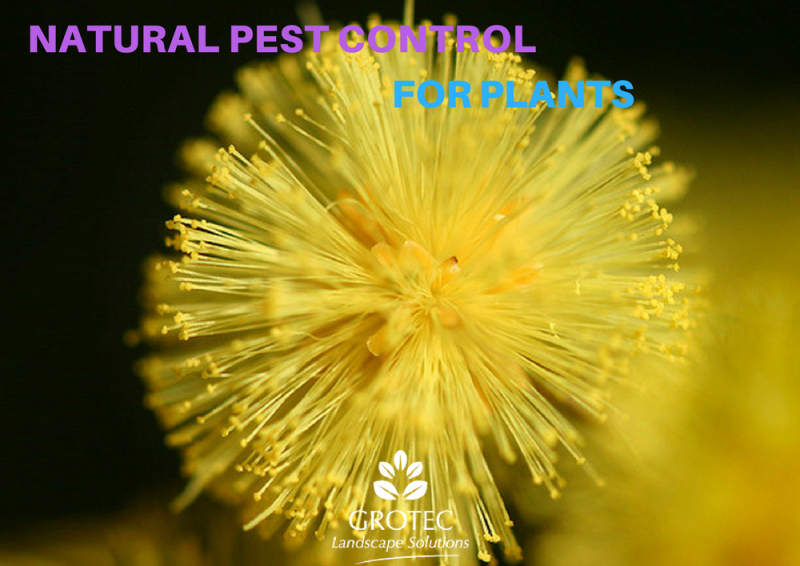 Using Natural Pest Controls for Plants is a great way to eliminate the critters while keeping the plants best interest at heart. Some treatments may need to be re-applied however it’s worth it to avoid contaminating or destroying the garden. Yates provide a wide range of Natural Pest Controls for Plants, some even treating more than one problem. The Yates Scale Gun is a great option when it comes to treating Aphids, Scale & Mealy Bugs by using natural ingredients. Controlling Citrus Gall Wasps is as simple as cutting off the infected stem containing the larvae and wrapping in a secure bag. Place the bag in direct sunlight, avoid doing this after winter as that is the time when the larvae are due to emerge. Using a sticky substance and string and tying it to branches will trap any returning adults leaving them stuck in their tracks. Although, if there is a small hole in the bump, the adults have already emerged leaving the larvae to do their dirty, damaging work. We hope everyone finds this information on Insect Identification and Treatment helpful, as always please read the instruction labels on any insecticides and wear the correct personal protective equipment. We hope that everyone can win the war and are able to enjoy all areas of the garden pest free and safe for future growth.